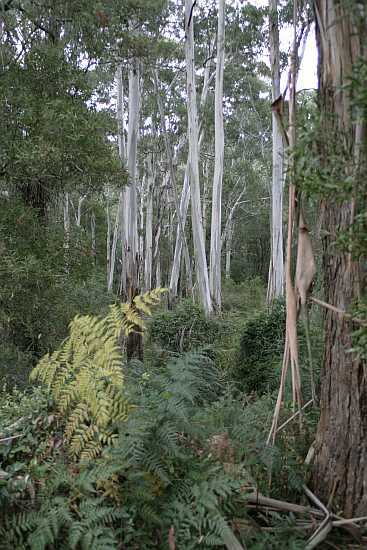 The Manna gums species (Eucalyptus viminalis viminalis), with their straight white trunks, are scarce on the Mornington Peninsula Eucalyptus pryoriana with its branching trunk is much more common. Leaves of Eucalyptus viminalis viminalis are narrow and often sickle shaped, fruit are round with 3 or 4 protruding valves and can often be found on the ground. Old trees in the area that escaped the saw mill have a wealth of hollows, home to a variety of birds, possums and sugar gliders. 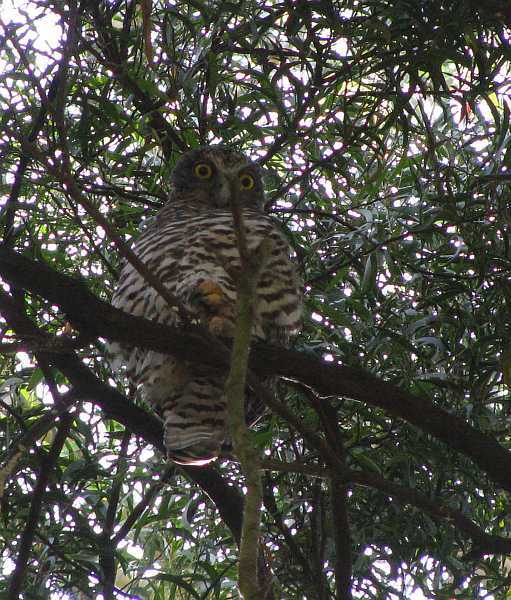 Powerful owls have been seen in this area. The forest in this gully is a mixture of several growth stages as much of it was logged in the early 1990s and cattle roamed over the area grazing young seedlings in the 1960s and 1970s. It was only in the early 1980s that the gully was fenced and cattle excluded from the area around the creek.